Equivalent to one year full-time study. Can be completed part-time. I really enjoyed studying, so after I completed my BVSc I decided to look at post-graduate papers. The MVM was an easy choice - it has an excellent range of companion animal papers that I was interested in and that were relevant to me as a clinician in practice. I was familiar with Massey, having completed my BVSc there. Importantly, the MVM also offered flexible learning options which fitted in well with my busy clinical schedules and the MVM (and the MU Library) offered excellent distance-learning support. The MVM also helped me prepare for, and successfully complete my companion animal surgery membership examinations with the Australian and New Zealand College of Veterinary Scientists. Finally, pursuing the MVM at MU was another reason to come back to New Zealand! The University environment (and the lecturers) provided a very conducive, supportive and encouraging learning environment. 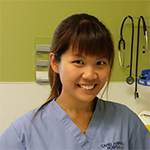 After graduating from the BVSc, I worked in busy small animal practices in Singapore, then returned to Massey University Veterinary Teaching Hospital as the Pfizer Surgical Intern in 2011. I then worked for a while at a local veterinary practice while studying towards my MVM. I have always been particularly interested in companion and working dog health, particularly canine hip dysplasia (CHD). I have seen first-hand in clinical practice how debilitating the disease can be. My ongoing interest in CHD formed the basis of my MVM dissertation, which provided a comprehensive literature review to the pathophysiology, genetics, diagnosis and treatment of CHD. The dissertation also included original research which was later condensed and prepared for publication in the New Zealand Veterinary Journal as two separate articles. I am passionate about animals and think I will continue to do research, specifically on both pet and working dogs. I can see how I can make a difference, so I want to do so! 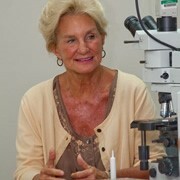 Mary Anna is a specialist in clinical pathology. She spent 32 years teaching in this area at Colorado State University. She is now based in St. Kitts, West Indies. She is active in continuing education to veterinarians and pathologists and has provided more than 300 scientific presentations and continuing education programs. She is author or co-author of numerous scientific publications, abstracts, proceedings, and book chapters, and is the primary author of a clinical pathology textbook, Veterinary Hematology and Clinical Chemistry.